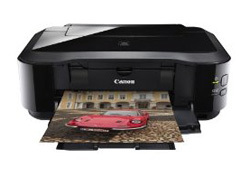 Printer Comparison has reviewed an inkjet printer from Canon that is targeted at photo printing. With a printing resolution up to 9600 x 2400 color dpi it should be able to make photo prints of high quality. Let us hear what the reviewer thinks about this Canon printer. Printer Comparison ends up giving the Pixma iP4920 an overall score of 3.5 stars out of 5 possible. This inkjet printer scores highest on design and ease of use, a little lower on print quality, features and print speeds, while it scores lowest on operational costs. The reviewer finds several positive points including low price tag, does not use much energy and the end results are great. There are a few negative points keeping the printer from getting a top score including it costs quite a bit to buy replacement ink and processing times could be better. Read the full review of the Canon Pixma iP4920 premium inkjet photo printer here.